I think I’ve found a better way to explain what makes fractal art so different than other art forms. The differences are there simply because fractals themselves are a different medium to work with. Fractals are different than paint and canvas or chisel and stone. In fact, fractals are probably the strangest kind of artistic medium of all. Consider, for example, the two very dissimilar and but equally well established mediums of painting and sculpture. The differences between them are actually much smaller than those which exist between them and fractals. For starters, both painters and sculptors can touch and alter their work with their own hands. Fractal artists can only interact with their work via the parameter settings of the fractal program. I would imagine that many people would consider fractals to be very similar to any other kind of visual art medium because the final products look that way. Fractal artists produce prints just as photographers do. Fractals are two dimensional images just as any painting is a flat, two dimensional image. Fractals can even be three dimensional making them appear to be just another way to make sculpture. But that’s looking at fractal art backwards! It’s more appropriate to look at how fractal art is made rather than how it appears in its final state. It’s more enlightening to consider the context the artist works in than the form the finished product takes. The differences are huge when one regards how the artist makes their so-called “paintings” and “sculptures”. When one only looks at the end result, they don’t see the deeper differences between fractals and other forms of visual art that are not observable in the gallery. The differences come from the process by which fractals are made; this is where fractals diverge enormously from other art forms. The strengths and weaknesses of fractals as an art form are different than other visual mediums because when an artist, even a great artist, works with fractals, they are working in a substantially different artistic medium. A medium that works differently. Being a painter matters little in fractal art because a fractal program doesn’t allow for any painting. One can digitally paint with a fractal image in Photoshop but that’s processing a fractal image, not generating one from a formula and rendering method. Digital painting has more in common with traditional painting than it does with fractal art, despite their common digital context. The irrelevance of painting skills is actually a liberating aspect of fractals for those who find painting or drawing to be a frustrating thing. Those people are not limited by their lack of traditional art skills because the fractal program does the drawing and painting for them. When a fractal artist goes to work what is most significant about their medium is not what they can do in it but what they can’t. Like I mentioned earlier, the fractal artist can’t alter the image with their hands like a painter can. Painters of course generally use brushes to do this but the brush is just an extension of their hand and is controlled by the artist’s gestures. Fractal parameters don’t understand or compute “gestures”. Another difference in the medium. So the fractal artist works remotely, through the parameter options of the fractal program rather than directly on the image like a painter or sculptor. This makes working with fractals quite a bit different, doesn’t it? You can’t move a spiral around or make the mandlebrot man look slimmer and less like a snowman. Sometimes parameter options will allow things like this, or possibly variations that approximate things like that, but those are options the formula and rendering methods make available not something the artist can always control like you can a paintbrush on a canvas. This lack of control which limits what fractal artists can do is also what gives fractals their greatest strength. Fractal formulas will run off and generate a huge panorama of imagery that few people (artistic or not) would never have imagined, much less realized, on their own. 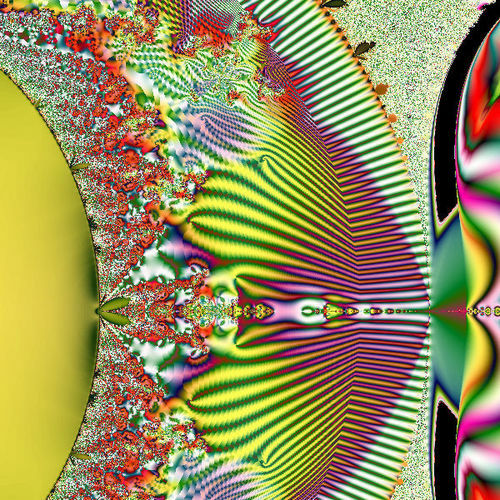 The artist doesn’t have to tell the mandelbrot set what to do or where to do it. Because of this the famous deep zoom animations are possible because the artist doesn’t have to draw all the (vertigo inducing) imagery required. Not even the most talented cartoon animator could produce one of those hypnotic ten-minute zoom videos. Or rather, the cartoonist’s zoom wouldn’t look the same and have the same awe inspiring effect. Just as one can’t paint with a fractal program, a painter can’t “fractal” with a paintbrush! You see now what I’m getting at, you horde of idiots? The fractal medium is characterized by geometric beauty and not intellectual expression. Fractal art is wonderful to look at but unavoidably stupid and empty-headed. It’s because of the way fractals are made and not because of the people who make them. It’s the medium! Now granted, there are a lot of stupid people in the fractal world but (fortunately) that never enters into the equation because, like I said, there are no variables for human gesture or other human-ly things in a fractal formula. So what can people do to make good fractal art? What are the artist-controlled variables (if any) in fractal art? Are we just frustrated painters in digital straight-jackets? Well, like I said, there really aren’t any directly artist-controlled aspects in fractal art apart from changing the parameter settings. So this is what fractal artists should focus on and concentrate their creative energies on. It’s actually the only thing they can work with and if other artists get different results it’s because they’ve manipulated the parameters differently. Now, strictly speaking layering and masking is processing although programs like Ultra Fractal incorporate these Photoshop functions right into the fractal program. I’m all for it because I’m all for more (and more) processing of fractal imagery. But you have to understand that these are not fractal and when you work with these kind of tools you’ve (silently) passed over into a different medium that doesn’t behave like fractal algorithms do because you’re not working with fractal algorithms anymore. But that’s why people do layering and masking; they’re trying to get their hands on the canvas, so to speak, and paint on the fractal imagery. It allows them direct control over the final image and to do things they can’t do with fractal formulas. Zooming and cropping is one aspect of making fractals that lies to some degree under the artist’s control. (It’s a bit like photography but only if you’ll overlook the fact that fractals are the only thing you can “photograph”.) Some creative selections of fractal images are unrecognizable to other artists who haven’t found that special place in the formula’s output. Color is something generally overlooked in the creation of fractals. Sometimes it’s hard to work with because, like all aspects of fractal imagery, it’s determined by things you can only slightly alter. But if you find it’s possible to generate random palettes (like in Xaos) or to cycle or edit the coloring then it’s worth the effort because good color can make anything look appealing. And don’t forget plain old experimentation. Experimentation is doing what hasn’t been done and it’s also the most enjoyable thing about fractals, just playing with parameters to see what will happen. I believe the main reason people get interested in fractals is they’re fun to play with or “highly interactive” as a psychologist would say. There’s no money in fractals; most artists are here for the graphical pleasure. But no matter what you do with your fractal parameters you’re not going to produce anything that lies outside the visual domain best described with words like: “design” “ornamental” “decorative art” and, the perennial, “beauty”. The intellectually expressive, reflective and works that make social commentary are things that require a degree of interaction and artistic control that the fractal medium just doesn’t support and can’t provide. But if you’re willing to accept such a limitation in a visual art form, then you’ll find fractals to be the greatest of all visual mediums for the easy creation and exploration of graphic design works, rivaling the ornamental and decorative genius of any human artist. Those are the strengths and weaknesses of the fractal medium.